LIFE is the EU’s financial instrument supporting environmental and nature conservation projects throughout the EU, as well as in some candidate, acceding and neighbouring countries. 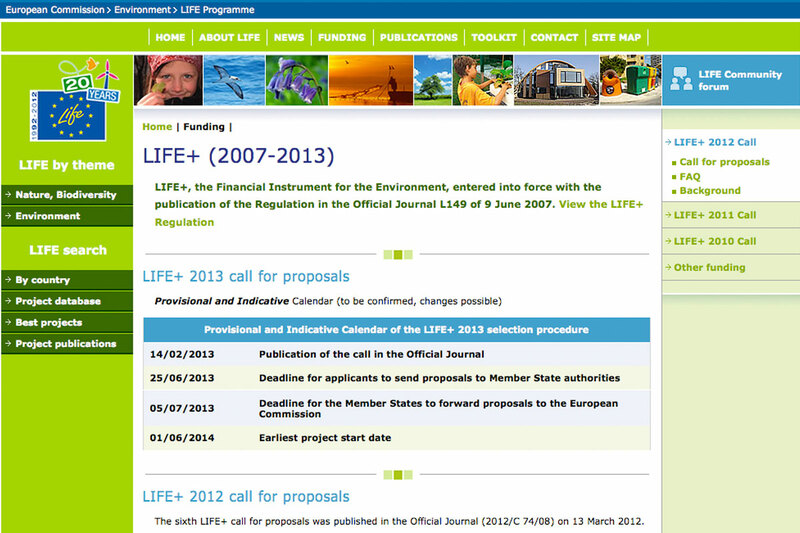 The LIFE Regulation, paving the way for the launch of the LIFE programme, passed into law on 21 May 1992. Since then, the Life programme in its various phases has co-financed more than 3,700 projects, with a total of € 2.8 billion. The current phase of the programme, LIFE+, runs from 2007-2013 and has a budget of € 2.143 billion. The legal basis for LIFE+ is the Regulation (EC) No 614/2007. LIFE+ covers both the operational expenditure of DG Environment and the co-financing of projects. According to Article 6 of the LIFE+ Regulation, at least 78 percent of the LIFE+ budgetary resources must be used for project action grants (i.e. LIFE+ projects). Proposals must be eligible under one of the programme’s three components: LIFE+ Nature and Biodiversity, LIFE+ Environment Policy and Governance, and LIFE+ Information and Communication. The Nature & Biodiversity component continues and extends the former LIFE Nature Programme. It co-finances best practice or demonstration projects that contribute to the implementation of the Birds and Habitats Directives and promote the Natura 2000 network. In addition, it co-finances innovative or demonstration projects that contribute to the implementation of the objectives of Commission Communication (COM (2006) 216 final) on "Halting the loss of biodiversity by 2010 – and beyond". At least 50 % of the LIFE+ budget for project co-financing must be dedicated to LIFE+ Nature and Biodiversity projects. The Environment Policy & Governance component continues and extends the former LIFE Environment programme. It co-finances innovative or pilot projects that contribute to the implementation of European environmental policy and the development of innovative policy ideas, technologies, methods and instruments. It also helps monitor pressures (including the long-term monitoring of forests and environmental interactions) on our environment. The Information & Communication component co-finances projects relating to communication and awareness raising campaigns on environmental, nature protection or biodiversity conservation issues, as well as projects related to forest fire prevention (awareness raising, special training). Since the launch of the LIFE programme by the European Commission, a total of 196 projects have been financed in Greece. Of these, 134 focus on environmental innovation, 58 on nature conservation and three on information and communication. These projects represent a total investment of €2 55 million, of which € 133 million has been contributed by the European Union.